If you are comfortable with taking some risk and are looking for better returns, you may consider multi-cap mutual funds. There are some mutual fund categories that walk into most portfolios because they fulfil basic investment needs that people are looking to meet. The recent consolidation of schemes mandated by market regulator Securities and Exchange Board of India (Sebi) and the prescription of exposure that each category can take to different asset classes and sub-asset classes makes it simpler for investors to assess the risk and returns from the schemes and their suitability to meet their needs. Most investment portfolios need a dose of equity for the growth impetus necessary for long-term goals and to ward off the effects of inflation. While investing directly in markets is an option, constraints such as time and make equity mutual funds a preferred option. Investors seeking relative stability and steady long-term growth can consider large-cap funds. These invest at least 80% of their assets in the large-cap segment, which consists of large companies with stable revenue streams, profitability and growth and the ability to ride through business cycles, making it the least risky sub-asset class of the equity markets. Shyam Sekhar, chief ideator and founder, iThought, recommends pure large-cap funds, exchange-traded funds and equal-weighted index funds for exposure to equity as an asset class. “Index funds are self-healing products," he said. “Indices are rebalanced periodically by the index maintenance authorities to keep it relevant." For more seasoned investors, focused large-cap funds that hold a concentrated portfolio of large-cap stocks may also be considered, he added. Data from Valueresearchonline.com shows that actively managed funds in this category have, on an average, been able to stay ahead of the benchmark in years when markets have appreciated. In the current year to date, while the Nifty declined 0.3% as of 2 November 2018, the returns of the five best performing funds on an average fell by 1.62%. Stay with passively managed products if you do not have the stomach for the uncertainty from the fund manager’s selections. 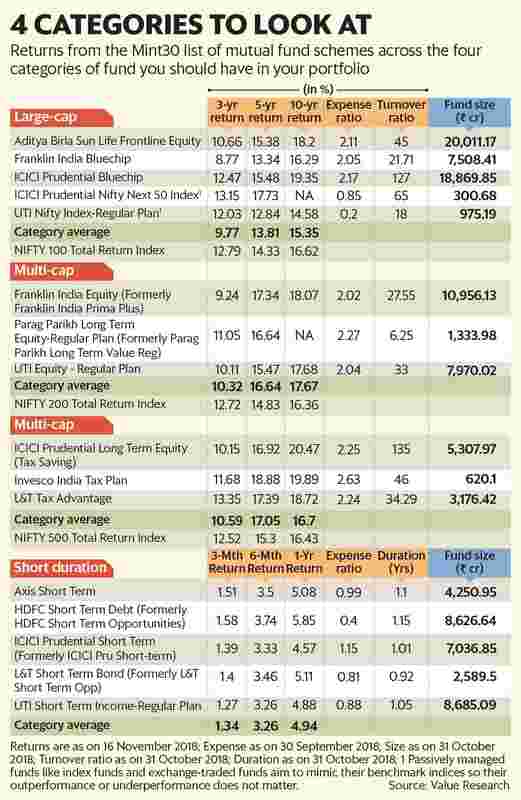 If you are okay with taking some risk and want better returns, then multi-cap funds are an option. They allow fund managers to move between large-, mid- and small-cap stocks based on their view of the relative performance of these segments and to invest in opportunities without the market cap constraint. These funds can diversify across segments and, therefore, can give better risk-adjusted returns. There can be significant differences in the way portfolios of schemes are structured and managed and, thus, a wide range of return and risk profiles are available. Shyam Sunder, managing director, PeakAlpha Investment Services Pvt. Ltd, uses 3-4 multi-cap funds as the core building block for the equity portion of his clients’ portfolio. To this, he adds large- or mid-cap funds according to the risk preference of the client. “The width of discretion that fund managers in such schemes have to react to situations and take corrective action in the event of poor performance of a sector or stock is what makes these funds attractive," he said. The category has used the flexibility to outperform markets in upward and downward cycles. In the current year, when broad-based Nifty 500 Total Return Index fell by 6.67%, the return of the five best performing funds in the category fell by an average of only 1.35%. In 2017, when the index rose by 37%, the category’s best performers averaged 49%. The investments you make for tax benefits under Section 80C should ideally follow your overall asset allocation. Equity-linked saving schemes (ELSS) score on performance, transparency and flexibility. They have a lock-in of three years which imposes the discipline of staying invested. ELSS portfolios are diversified across market caps and sectors and the lock-in period gives fund managers the leeway to explore opportunities without the pressure of redemption. The category gave a 9% return in the preceding 3-year period and 15.75% over 5 years. Sekhar sees wealth-building opportunities in ELSS. “The error they make," he said, “is in treating it like other tax-saving products and not implementing the discipline essential to equity investing like investing periodically to benefit from cost averaging and holding for the long term." Debt funds with short terms meet the financial need for a safe product to hold funds with the benefit of liquidity and ease of making transactions. Such funds include liquid, ultra-short duration, low duration and short-duration funds. Each of these is distinguished by the maturity profile that the portfolio can hold which in turn determines volatility from the mark-to-market element in the scheme’s portfolio. Liquid funds and ultra-short duration funds offer liquidity and negligible volatility. Sunder looks for funds with decent performance and ones that provide convenience such as online and mobile platforms to move funds quickly. Another financial need that these funds can meet is that of holding that portion of your emergency fund where the focus is on ease of access and stable value. These are roles that a savings bank account has been fulfilling so far. These funds are able to replicate these services with better returns. Another use for these products is to hold the realised corpus for a goal till such time the funds are required. The money is safe as well as earns some returns in the interim. Sekhar recommends these funds extensively for executing systematic transfer plans (STP) or to hold funds till the time investment choices are made. Replacing bank deposits with mutual funds may be a stretch for many investors, said Sekhar. The comfort of familiarity and the reluctance to add one more service provider may be a hurdle for many, feels Sunder. At the same time, Sunder sees many investors in the 30% and 20% tax brackets making the switch to debt funds to take advantage of the indexation benefit that applies when you hold a debt fund for at least three years. This benefit is not available on bank deposits. Sunder recommends short duration funds and corporate bond funds holding shorter duration good quality paper. Another product that can easily fit into a portfolio, according to Sekhar, are fixed maturity plans in place of company fixed deposits. They keep volatility to the minimum and spreads credit risk to multiple companies. Your mutual fund investments have to work in tandem with other products in your portfolio to reach your goals. Always look at a portfolio in its entirety.